For example, gasoline has a flash point of approximately -40 degrees C (-40 F) and is more flammable than ethylene glycol (antifreeze) which has a flash point of 111 degrees C (232 F) in closed cup tests (see below). A closely related and less common term is fire point, the temperature at which the flame becomes self-sustained so as to continue burning the liquid (at the flash point, the flame does not need to be sustained). The fire point is usually a few degrees above the flash point. 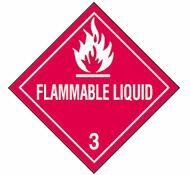 The U.S. Department of Transportation (DOT) requires that all substances transported have a flash point determined and that any materials with flash points lower than 60 degrees C (140 F) be handled with extra caution. OSHA's Standard 29 CFR 1910.106 mandates flash point determinations using one of two standardized testing methods specified by the American Society for Testing and Materials (ASTM). See the next section for details. Other agencies and sections of the U.S. Code may specify alternative methods, but the general concept is similar in each case. Flash points are determined experimentally by heating the liquid in a container and then introducing a small flame just above the liquid surface. The temperature at which there is a flash/ignition is recorded as the flash point. Two general methods are called closed-cup and open-cup. The closed-cup method prevents vapors from escaping and therefore usually results in a flash point that is a few degrees lower than in an open cup. Because the two methods give different results, one must always list the testing method when listing the flash point. Example: 110 oC (closed cup). (a)(14)(i) For a liquid which has a viscosity of less than 45 SUS at 100 deg. F. (37.8 deg. C.), does not contain suspended solids, and does not have a tendency to form a surface film while under test, the procedure specified in the Standard Method of Test for Flash point by Tag Closed Tester (ASTM D-56-70), which is incorporated by reference as specified in Sec. 1910.6, shall be used. (a)(14)(ii) For a liquid which has a viscosity of 45 SUS or more at 100 deg. F. (37.8 deg. C.), or contains suspended solids, or has a tendency to form a surface film while under test, the Standard Method of Test for Flash point by Pensky-Martens Closed Tester (ASTM D-93-10) shall be used, except that the methods specified in Note 1 to section 1.1 of ASTM D-93-10 may be used for the respective materials specified in the Note. The preceding ASTM standards are incorporated by reference as specified in Sec. 1910.6. (a)(14)(iii) For a liquid that is a mixture of compounds that have different volatilities and flash points, its flash point shall be determined by using the procedure specified in paragraph (a)(14) (i) or (ii) of this section on the liquid in the form it is shipped. If the flash point, as determined by this test, is 100 deg. F. (37.8 deg. C.) or higher, an additional flash point determination shall be run on a sample of the liquid evaporated to 90 percent of its original volume, and the lower value of the two tests shall be considered the flash point of the material. (a)(14)(iv) Organic peroxides, which undergo auto accelerating thermal decomposition, are excluded from any of the flash point determination methods specified in this subparagraph. Flash points must be determined under a set of reproducible circumstances. Automated testing equipment is available. Shown below is one example, a Miniflash closed-cup tester available from Petrolab. A variety of other testing equipment is also available from other sources. If you do not want to buy your own equipment, simply consult your local phone directory under "Laboratory, Testing" or a similar heading to find a company that can run a flash point determination for you. Or check the ASTM testing lab directory. Know the flash point of any material that you work with. Always avoid heat, open flame, sparks or other sources of ignition when a material is near, at or above its flash point. A common laboratory error is failure to pay attention to flash points when using a heating bath. See this document on heating bath materials for more info. Flash Point - Fuels at The Engineering ToolBox. The Relationship Between Flash Point and LFL with Application To Hybrid Mixturs at Chilworth Technology. The ASTM has many standards available for purchase that include or cover flash point. WolframAlpha is a computational search engine that can return all kinds of chemical data, including flash points for various materials. See also: combustible, flammable, NFPA.